Her 7-year-old’s drawing is a haunting reminder to parents to closely monitor kids online. This mom’s viral post reminds parents why we can’t afford to become complacent with our kids’ online activity. I have three kids. They’ve all spend a decent portion of their childhoods on screens of various kinds. I’ve always tried to be diligent about parental controls and monitoring what they’re doing and keeping open communication about online safety. But I also know how easy it is to slip into complacency. When enough time goes by without any issues, it can be tempting to assume everything is as it should be. But unfortunately, that’s not always the case. Kids youtube, roblox, fortnight… no matter how much you think you are monitoring your child.. notifications to what your child is watching. It doesn’t matter. My 7 year old child was taught how to attempt suicide by kids youtube and these games. She has expressed that she doesn’t feel neglected or unloved. 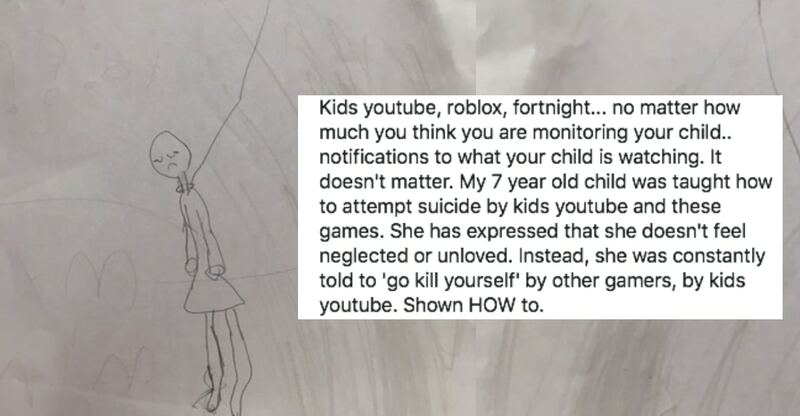 Instead, she was constantly told to ‘go kill yourself’ by other gamers, by kids youtube. Shown HOW to. Leeper shared a photo of a drawing her daughter had created at school of a person hanging with a noose around their neck. Yes. At age 7. PLEASE, keep your children away from these things. I’m just so glad my child was able to express her feelings before she actually tried to harm herself. I never thought something as ‘innocent’ as kids youtube would have these subliminal messages. Again, I’m only sharing our experience in the hopes to prevent another child going through this. Other parents have shared similar stories of being blindsided by disturbing content during seemingly innocent videos. A parent who chose to remain anonymous shared a story on Pedimom about how a kids video she was watching with her child was suddenly interrupted by a brief lesson on how to cut yourself. “It was a simple, innocent cartoon – until it happened,” she wrote. “Four minutes and forty-five seconds into the video, a man quickly walked onto the screen, held his arm out, and taught the children watching this video how to properly kill themselves. What did I just see? Did I really just see that? I immediately turned off the video. My son’s nose stopped bleeding, and I further investigated the video in private while he went to play. I watched it again, certain that I had dreamt it up. I know YouTube had some sick videos, but I thought YouTube Kids was safe. They sure make it seem like it is. But – no. There it was again. Four minutes and forty-five seconds into the video. The man quickly walked in, held his arm out, and tracing his forearm, said, “Kids, remember, cut this way for attention, and this way for results,” and then quickly walked off. Not much shocks me. I’m a physician, I work in the emergency department. I’ve seen a lot. But this did. Pedimom said that the video had been removed from YouTube. But these are not completely isolated incidents. Parents should know what their kids might be exposed to, even on supposedly kids-safe channels. Wired shared an article less than a year ago titled “Children’s YouTube is still churning out blood, suicide and cannibalism,” which details the ways in which violent, sexual, and otherwise not-kid-friendly content was slipping past filters on Kids YouTube. Most of these videos feature beloved characters from Disney or popular children’s shows like “Paw Patrol,” and unsuspecting kids end up seeing them tortured, maimed, killed, or put in sexual situations children should not be seeing. The New York Times shared a similar article detailing videos in which kids’ show characters go to strip clubs, urinate on one another, lie in pools of blood, and kill themselves. Unfortunately, kids may innocently trip into these videos without realizing it, as the descriptions often use words like “educational” and “learning” to make them seem like quality content. YouTube generally uses detailed automated filters to screen videos, but weirdos can be sneaky and there are limits to algorithms. Clearly. So word to the wise, parents. Be vigilant and don’t leave kids alone with screens, even if you think they’re on a channel that’s made for kids. Make sure your kids show you anything they see that seems “off,” and immediately report any disturbing content you come across. And maybe consider just giving your kids a box of LEGOs and some dress up clothes and calling it a day. Put on a DVD if they want some entertainment. Most kids can wait a little longer for online access, especially if it keeps the creeps of the world from destroying their innocence.